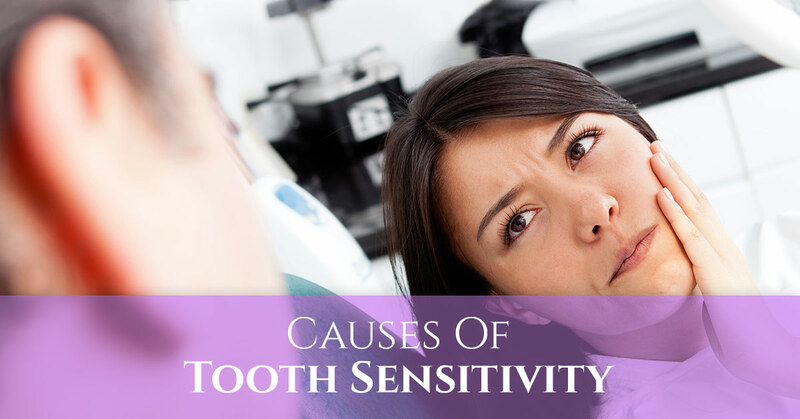 Dentist Lawrence: What Causes Tooth Sensitivity? but what causes it in the first place? TMJ disorder (TMD) occurs when there is a problem with the temporomandibular joint, which is the joint that connects your lower jaw to your skull. Many people experience tooth pain due to TMD that is often confused with a problem in the tooth itself. Additionally, tooth grinding is a common occurrence in people with TMD, and that can also lead to sensitivity in the teeth caused by wear on teeth. If left untreated, gum disease, or periodontal disease, can cause the gums to recede. There are thousands of tubes in the roots of your teeth that carry hot, cold and sweet sensations to the nerve center, which is also called the pulp. When your gums start to recede, it exposes the sensitive root of the tooth, leading to tooth sensitivity. Gum disease can be prevented with proper oral health, including brushing, flossing and visiting your dentist regularly for periodontal therapy. Cavities, or tooth decay, causes tooth structure to erode and if left untreated can compromise the root of the tooth. This makes the tooth very sensitive to even minor stimuli, including food or drinks that are hot, cold or even too sweet, as well as the air itself. Like gum disease, tooth decay can also be prevented with proper oral hygiene and regular visits to the dentist to evaluate the health of your teeth. Bruxism, also known as teeth grinding, causes the enamel of your teeth to wear down over time. Once the enamel is worn through, dentin is exposed which is can be very sensitive to stimuli like cold and hot drinks. Much like gum disease and tooth decay, as the problem progress, it leads to increased sensitivity and other dental issues. When most people experience tooth sensitivity, they simply choose a different kind of toothpaste or stop eating certain foods. However, as you can see, tooth sensitivity is often a symptom of a much bigger oral health issue, so if you are experiencing it, don’t just ignore it. Instead, get the treatment you need by turning to James Otten Dentistry. We will treat the root of the problem, not just the symptom, so that you can experience true relief. Schedule your appointment today.